Sweetly scented bright yellow blossom in winter and spring providing fragrance & a valauble nectar source for early flying bees. It's also evergreen so attractive all year round with its grey green filigree foliage. Plant in the garden in milder regions or a large pot in sunny courtyards, patios or conservatories. Supplied as a 70cm tall tree on a cane growing in a 3 litre pot. Transition the seasons from winter to spring with bold and bright colour year after year! 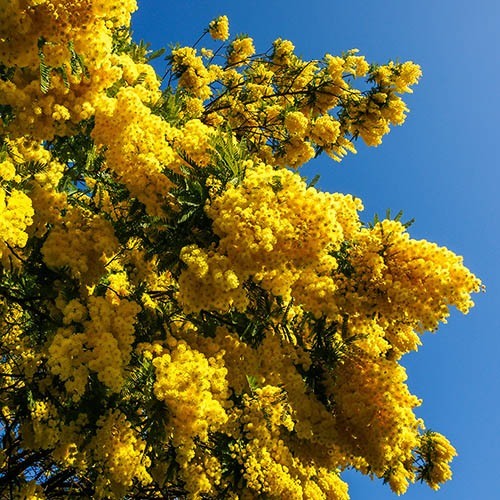 The canary-yellow blooms of the Flowering Mimosa Tree are a spectacular sight from January to April every year. Hundreds of bobbly yellow blooms smother the branches of the Mimosa tree in a lemon haze, almost hiding the stunning grey green filigree foliage that makes this tree a handsome year round feature in the garden. The eye-catching pom-pom blooms not only look a picture but carry a heavenly fragrance and provide a valauble nectar source for friendy insects that emerge in milder weather. Altogether a super tree to own! Widely seen across southern Europe, this variety will thrive outdoors in most of the UK too and is a great plant for conservatories or sunny corners of a room indoors in regions prone to severe frost. It's a great choice for a large container too producing a really unique feature tree.